Pipeline and tanker operator Kinder Morgan Energy Partners said Monday it has expanded its contract with General Dynamics NASSCO for the construction of a fifth 50,000-ton tanker that can also be converted to carry liquefied natural gas. The 610-foot-long “ecotanker” will be a sister ship to the four “Jones Act” tankers Kinder Morgan currently has under construction at the NASSCO shipyard in San Diego. 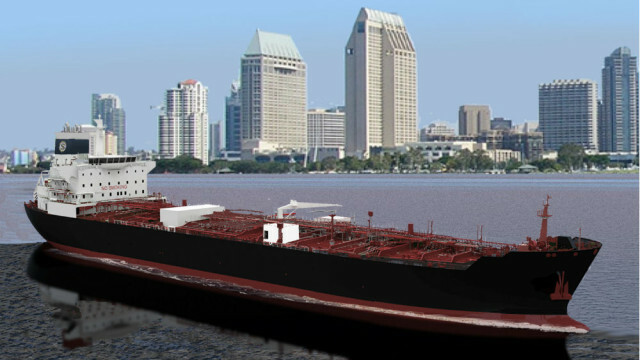 NASSCO is also building three similar tankers for Seabulk Tankers. The Jones Act requires that goods transported by water between U.S. ports be carried on ships constructed in the United States. Kinder Morgan Energy Partners is a leading pipeline transportation and energy storage company. It owns an interest in or operates approximately 54,000 miles of pipelines and 180 terminals. It acquired American Petroleum Tankers in January.